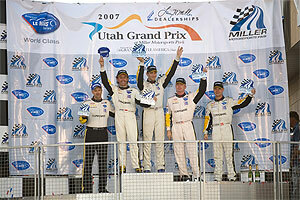 Oliver Gavin and Olivier Beretta scored their fourth win in five starts this season, taking the GT1 class honors in the American Le Mans Series Utah Grand Prix at Miller Motorsports Park. The "two Ollies" completed 61 laps of the 4.5-mile circuit in their No. 4 Compuware Corvette C6.R, finishing 26.550 seconds ahead of Jan Magnussen and Johnny O'Connell in the No. 3 Compuware Corvette C6.R. The two Corvettes finished eighth and ninth overall. Gavin started at the back of the pack after the team elected to change tires that had been flat-spotted in a spin during qualifying. Per ALMS rules, the pole-winning Corvette was relegated to the 25th starting position after the tire change. But Gavin dispatched the entire GT2 field on the first lap, gaining nine positions. By the third lap, he was 3.5 seconds behind the No. 3 Corvette, which had started 12th. "There was quite a melee in the first corner with cars going off the track, and I was trying to be very careful because the last thing I wanted to do was damage the car," Gavin recalled. "I managed to pick off cars one by one. Then I caught up behind one of the prototypes - that was a problem because we were much quicker in the corners but their car was like a dragster in the straights. Finally he went wide in Turn 15 and I managed to get past him." C6.R 4 Pit Stop A full course caution at 11:50 into the race reduced the margin between the two Corvettes to .6 seconds. Then after the first round of pit stops at the 40-minute mark, the No. 4 Corvette emerged with the lead. "As I came in for the pit stop, Ray Gongla, my crew chief, said on the radio, 'Make it count!'" Gavin recalled. "I pushed and pushed, the crew did a fantastic pit stop, and we managed to get out just in front of Jan. I have to say that our engineer, Steve Cole, and the team gave us a brilliant race car today." While Beretta savored his record-setting 32nd career ALMS victory, he was focused on the team's next race, the 24 Hours of Le Mans. "It was a very important day for us because it was the last practice before Le Mans," said Beretta. "We had to finish with the car in one piece because it will fly to France in a few days. We want the mechanics to be well rested because they've done a fantastic job since the start of the season. We went through three street races without any accidents and now we've completed a successful Michelin tire test. We are ready to go to the big one now." Corvette Racing program manager Doug Fehan agreed: "It was a perfectly executed race today and we learned a tremendous amount," he observed. "I think we've made a very good tire selection for Le Mans; the last compound we had on looked really good, so we're excited about that. We'll be as prepared as possible." Magnussen had to contend with a transmission problem in his two stints in the No. 3 Corvette C6.R. "In the first stint I had some trouble with the gearbox on shifts," he noted. "That problem got better in the second stint, but I couldn't count on it not coming back so it was hard for me to push. Still, we did have a good test of the tires, and that will be useful for us going into Le Mans." Magnussen's teammate Johnny O'Connell also has his eyes on the Le Mans prize. "The next stop is Le Mans, and we're hoping for good fortune there," he said. "We've certainly done our homework in these last races." For team manager Gary Pratt, today's race was business as usual. "It was a smooth run, and I'm proud of the drivers and crews," he said. "Everybody kept it on the track. And when Olivier's happy with the tires, that's a good sign for Le Mans." Corvette Racing's next event is the 24 Hours of Le Mans in Le Mans, France, on June 16-17. The 75th running of the classic 24-hour endurance race on the 8.5-mile Circuit des 24 Heures du Mans will begin at 3 p.m. local time (9 a.m. EDT). Portions of the race will be televised live on SPEED.